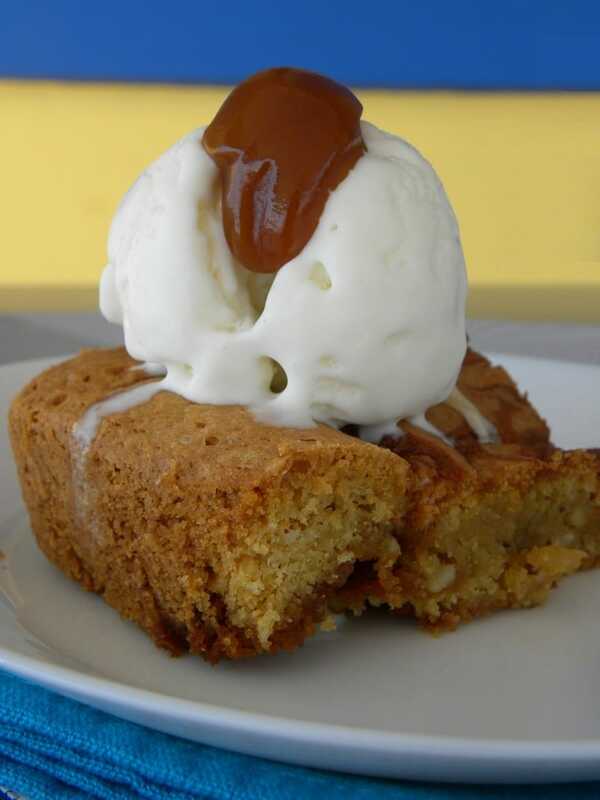 Blondies, which are also known as blonde brownies, are a confection similar to bars and brownies but instead of cocoa powder, vanilla is added for flavour and always made with brown sugar, which gives them a butterscotch flavour. The main ingredients of Blondies are flour, brown sugar, butter, eggs, baking powder, vanilla and walnuts or pecans. Some times white chocolate chips or butterscotch chips are added. My recipe was made using white chocolate, which was cut into small cubes, toasted walnuts, homemade Salted Caramel and Masticha, which is an aromatic Greek resin, known as mastic. If you don’t have masticha, just leave it out and add vanilla. Last month, it was my blog’s 10th Anniversary so I started early thinking what recipe to post. I wanted to make something easy as I was quite busy and as I’ve posted most of the traditional Greek desserts, I rembered that years ago I bookmarked some “blondies” but never got around making them. August was a very busy month so unfortunately I did not have any free time to post the recipe. In fact, this may be the only recipe I will post for September, as it’s quite busy as well, but I want to take this opportunity now that I have some free time, to thank all my readers for visiting my blog, which gives me strength to continue blogging for a few more years. Although the outcome was delicious, it was too sweet for my taste and they also turned out a little dry. I decided to cover them with Salted caramel and the result was more like caramel bars. Towards the end of August, our children came to visit and stay with us for a few days, so I decided to make them again. This time I changed the recipe, by adding far less sugar, less flour, toasted walnuts, masticha as well as another egg. I had some leftover salted caramel, which was not enough to covered them, so I decided to put the salted caramel inside and flavoured them with masticha, which gave them a “Greek” taste. I also baked them for less time. The outcome was amazing with a cookie-like crust on top and soft inside with its caramel and mastic flavour being a temptation to just eat a small piece. Served with some Greek “kaimaki” (mastic flavoured) ice cream and some more salted caramel on top makes this dessert perfect for a hot summer treat. As this is a very rich dessert, if you serve it with extra ice cream and caramel on top, my suggestion would be to cut the blondies into 16 servings. It can be good for 3 – 4 days at room temperature, for a week in the fridge or upto 3 months in the freezer. You can watch the video how I made them here. Lightly butter a 17 x 25cm Pyrex. Cut the chocolate into small cubes. Pound the mastic tears with flour or sugar and pass it from a sieve. Toast and crush the walnuts. Whisk together the melted butter and sugar in a bowl until combined. Add the eggs one at a time and masticha or vanilla and whisk for a few minutes. Add the flour, baking powder, baking soda and salt and mix it all together until combined. Stop the mixer, add the walnuts and white chocolate chips and fold with a spatula. Pour it into the buttered pan and spread it evenly. Add the caramel with a spoon and spread it to form a marble effect. Bake for about 25 minutes or until a tester inserted into the center comes out clean. Allow to cool and cut it into 12 squares or rectangle bars. Serve with Kaimaki ice cream and extra salted caramel on top! Add the flour, baking powder, baking soda and salt, mix it all together. Pour it into the pan and spread it evenly. Bake for about 25 - 30 minutes or until a tester inserted into the center comes out clean. If you liked my recipe pin it on Pinterest to make it later on or when you make it, I would be glad to see your photos on Facebook, Twitter or Instagram, using the hashtag #blondieskopiaste or #Greekstyleblondies . That looks extra rich with caramel 🙂 Happy 10th Anniversary, Ivy!